I acually had a professor like this! He was fun and frustrating at the same time. 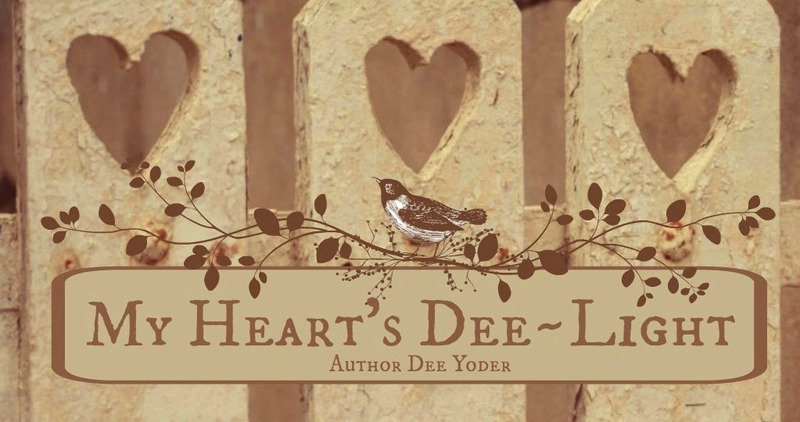 For more great fiction, go to Dorinda's Treasures in Jars of Clay blog. My name is Mort. And when I say Mort, I mean MORT. I wear a purple lab coat and a sequined bow tie that spins and lights up when I press a hidden button. I’ve had some spectacular life experiences. Indeed, I could fill a book with them, but I’ll only share a few choice moments. Building things is my hobby. I built a plane once using the Popular Mechanics article, “Build Your Own Solo Plane in Two Weekends.” It took me two months to accumulate the stuff, and then another month to convince my wife to let me tackle another secret project, but oh doggie, once I got started, it was a “cinch-arino”. I worked nonstop on that cool baby for three months, but just when my wife was starting to get mean about my hobby, I surprised her with my announcement that the marvelous machine was ready to F-L-Y! When she laid eyes on my perfected project, a look of wonder, then bewilderment, and finally amusement, spread over her face. “Yessirree Bob, and it’s a dandy, isn’t it?” I proclaimed proudly. “Yeah! Um…uh-oh. Oooh…yeah.” That was a bummer realization. I deflated like last week’s birthday balloon. Hmm…had to get it out of the basement…righto. My wife watched me in silence for a second, shook her head, and went chuckling upstairs to finish dinner. Took me two months more to take it apart and put it together again in the barn, but what a beauty! I love my students. They tickle my funny bone with their silly questions and their serious faces. They seem to appreciate me, too. For instance, today I wrote the entire genetic plan of the red-eyed, vestigial-winged fruit fly on the chalkboards. The entire time I was scribbling out the charts, my rolling commentary kept the class howling like banshees. I never dreamed Genetics could be so humorous to them. Weird though, when I got to the end of the third board, the chart was totally wrong. Tom pointed out to me the source of my tiny error. Seems I switched the F1 parents with the F2 offspring way back on board one. Oh well. A little erasing and an hour later, the charts were complete and accurate. Too bad the class ended before I finished the F5’s. Just before I went home, one of my students needed to come in and do a make-up lab. I told her I’d be happy to help her out. I proceeded to carefully place Professor Beech’s bounteous and beloved beaker over the Bunsen burner. My student turned out to be cautious and observant. Very astute. Yessirree Bob! An ace student, for sure. She did a wonderful job helping me mop up the mess. My favorite class is Anatomy and Physiology. The day we went to collect animal parts from the farm down the road was a glorious example of higher education. It was a happy “co-ink-a-dink”, too, that spaghetti with meat sauce was on the menu in the cafeteria. What a great way to learn where our food comes from! I want my students to handle the merchandise, so to speak, and enjoy the natural beauty of God’s creation. I often encourage them to “get their hands in there and learn, learn, learn!” Too bad so many were squeamish that day; they missed out on observing the beautiful cerulean color of the vitreous matter of the cow’s eye. It was gorgeous! The Anatomy class gives me the chance to exploit my favorite joke of all time. When the students come in the door, I say, “Welcome to Mort’s Mortuary! You stab ‘em, we slab ‘em!” They love that. And it’s an apropos introduction to the “Picking Up Road Kill for Further Study” lesson. Too bad the class is right after lunch. Some students don’t seem to take my little joke well; I think the carbs are a detriment to their learning experience. Makes them sluggish and pale. That reminds me; I wonder why Brenda Bradley turned green and ran out of class yesterday? I hope she doesn’t have the flu. I’d sure hate to have her miss the “Picking Apart Your Formaldehyde-Preserved Dog Fish Shark” lesson. Well, he's in, and in case you were wondering (as I was) who confirmed him, here's the list. I noticed that Sherrod Brown, whom I contacted and whom I received a "thank you for contacting me" email reply, didn't vote at all. That's one way to avoid controversy. (CORRECTION: I WAS SENT A NOTE THAT MR. BROWN WAS NOT TRYING TO AVOID CONTROVERSY. HE IS IN HIS HOME STATE TAKING CARE OF PERSONAL FAMILY MATTERS, SO WAS NOT AVAILABLE FOR THE VOTE. I WANT TO BE FAIR TO HIM ON THIS ISSUE.) But Senator Voinovich, who didn't respond to my email by one jot or tittle, voted to confirm him. Thanks, Mr. Republican! What frosts me the most is the idea being put out there by many stalwart senators that Geithner had "paid up and made it right". Really? Geithner waited until he was being "vetted" for the Treasury Secretary job to pay up and make it right. Ick. 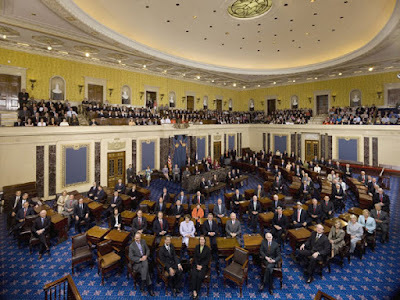 That feels slimy, but perhaps our senators are used to that slick feeling by now. Having the experience of seeing my dad struggle with Alzheimer's disease has led me down paths of spirituality that I'd rather never have traveled. When a terrible disease such as this one waltzes into a family, a major split in philosophy of life often occurs. One group of loved ones may decide that quality of life has to take precedence over quantity. How often have I heard people say: "If I had to live like that, I'd rather just go ahead and die." On the surface, this sounds like a noble and heroic statement. But I've seen a good man struggle to keep each breath and each moment of life he had left be a holy mission: to honor His Creator with whatever little bit of strength and life he could muster. I saw my late husband strive to live one more day...one more hour...one more minute...and he did it with far more grace than I think I could muster. The intensity of good men to honor living with their last breath feels to me like an honest recognition of God's genes in them. In a sense, they see each breath as holy...a holy mission from God because to keep living, in the face of pain and adversity, is do God's will to the nth degree. I struggle now with this quality of life philosophy because in my dad, I see God. In my dad, I feel a breath from his mouth that was begun in Adam and came from God Himself. In my dad, I still see his hands and his feet and the little things that still bring him joy. In this illness, all but the barest pleasures...the ones we come into the world with: the desire to feed and to laugh and to see our loved ones faces, are often the only things left. I have learned to strip down my definition of the "good" life to mere seconds in the tiniest of moments that could be called "good". I've learned to find great treasure and great worth in seeing Dad cross his ankles and tap his toes...it means he's content. I sigh and say, "That is good...he's feeling no pain for right now." When I stroke his soft, spiky, white hair, and his eyes close in comfort, I say, "This is good...he's feeling my love and concern for him: he knows I care." He may remember in that very moment only, and not much beyond a moment, but I've had to learn that it's enough. Life is good for that minute or two. There are sparks of life in Dad that surprise and confound us still. When I see that, I know life is good...I know His Creator has blessed him and us...and I squelch the selfish side of me that deigns to think there should be more. I'm beginning to know that the act of living...Dad's perseverance to keep fighting...a sigh of happiness from him that shows his pleasure in something as simple as a cup of hot coffee, is a holy act ordained and given as a gift by God. I sometimes find myself wanting to say out loud: "You have given my dad so much...and You have blessed his kids so much...even in Dad's illness, You are a holy and loving God." There are some members in my family that would not agree. Some will find this attitude unrealistic or even wrong. But in my heart and soul, more and more I am learning that the bending of the will...the surrender of the wants...the sigh that says, "I let go of how I want it" is more an act of worship than any other kind of sacrifice I could offer to the Lord. And to say to God, with hands lifted up-- holding nothing--"I am blessed" has to be one of the dearest offerings God can receive. Quality versus quantity...the wants versus the is...the desires versus the reality...they are all a measure of a heart. Taking a life and holding each little thing as sacred, and offering back to God our loved one's futures--whatever they may be--that, to me, is recognizing the holiness in each soul that comes only from the hand of God. For these reasons, I have come to the conclusion that Do Not Resuscitate orders are contrary to right to life thinking. To me, it is better to ALWAYS opt for life. "Lord, thank You that each breath You breathed in my dad has Your loving DNA mingled through it. Continue to help me see each living moment that Dad has left as a gift from Your hand...and help me to know that whatever You do for Dad in the next few days, You have ordained it holy and worthy and right. In Jesus' lovely name, Amen." “Man, did you see who you’re scheduled to swim rats with today?” my colleague, and locker companion asks with a laugh. “Nope. Haven’t looked at the schedule. I presume I’m going to be setting up my mouse study in Repro,” I mutter while I pull on my scrubs. For some reason, though I don’t know Phoebe Wise that well, I don’t want Perry talking bad about her. I’ve only worked with her a few times before, but she caught my attention. Quiet. A little shy, but really smart. Hard worker. She’s never let me down any of the times she’s taken my studies on my weekends off. I check the schedule to see which room the behaviorals are in. Well, looks like we’ll be swimming the F1 generation today. I hate that behavioral. Boring and long. Some of the rats are quick studies, but some can take the whole sixty seconds and still not swim their way to the end of the maze. Sixty seconds doesn’t seem like a lot of time until you multiply it by fifty critters. “Hi Ben,” Phoebe says with a smile when I enter the room. I like Group Ones best. Defective genes rarely affect the control animals, but the higher groups could have potential delay deformities. With Group Twos whose parents have defective genes we could end up with more animals not being able to figure out the maze, which means a longer amount of time in this room. “Okay. Go ahead and drop the first guy.” I set the timer. Phoebe leans over the tank and gently releases the first male into the water. He swims in a circle for a second and then takes off around the perimeter of the maze. Phoebe has nice hair that lies along the back of her neck like a scarf. I watch her eyes follow the pup around the maze. Her smile is still in place, and she chuckles gently as she records the rat’s swift progress. My question startles her, and she delays answering me while she retrieves the pup from the water. “I needed peace, Ben,” she finally answers. Her eyes meet mine, and I get the feeling she’s reading my mind. “Peace. Huh. Well, I know how lack of peace feels,” I say with a laugh. Now how did she know I was thinking that? She’s looking at me with such genuine concern that I feel tears gathering at the edge of my eyelids. Whoa. Time to get back to work. Get a grip, Ben. We finish the rats in less than three hours, and I head out the door to my next assignment. Phoebe catches my eye just before I close the door to her study, and her gentle smile makes me stop. I don’t answer her, but she stays put in front of me. Again, my throat aches suddenly with a sad kind of longing, and Phoebe seems to know it, too. She pats my arm before heading back to her study. I nod mutely and turn to leave. One last time I glance back at Phoebe, and even her shoulders seem set with purpose and strength. “What makes Phoebe-the-Wise so wise?” I ask myself. “Is it some kind of spiritual gift that only Christians have?” I don’t know, but I plan to find out. Someday. While searching for a list of literary agents that represent Christian authors, I came across this post written by Michael S. Hyatt (President and CEO at Thomas Nelson Publishers). His blog, From Where I Sit, has a list of agents with whom his company is familiar. I plan to take a day or two to read through this list and check out these agents. 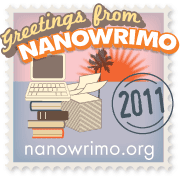 Mr. Hyatt's blog is chock full of informative posts that are of great value for the green writer (like me). I really want to set aside a week devoted only to researching the next step, assessing my book's status, and further compiling my novel. Now if only I could find a week that is not filled with "other" stuff! It's quiet here, save for the soft sfffft sound of the ventilator. It's Sunday night, after dinner, and I'm sitting in my dad's ICU room in the dark. The weather channel is playing in the background because Dad loves weather as much as a meteorologist does. We're hoping he'll listen and hear familiar things as he goes in and out of sleep. He has begun to waken and his eyes search the area right around his pillow until he locks onto the eyes of his family. He hasn't been responding to the staff, but the last time he had pneumonia, he did the same thing. For his family, he opens his eyes and shakes his head--slightly. All the vital signs are stable and for now, we're content just to watch and wait and offer him reassurance and comfort when he looks for us. As I sit here, I think of how many life and death experiences our family has known within these hospital walls. Tears of sadness and tears of joy have all been shed in this place. Fifty-two years ago yesterday, I made my debut in the world in this building and as I watch over Dad for a time tonight, I think back to what a day it must have been for him and Mom that snowy January Thursday. My sister was just a baby, too...thirteen months old...so Mom was worried about her and anxious to get home. Dad has always loved his kids and enjoyed every minute he spent with them, so I imagine that day years ago was a happy moment for him. I have him to thank for my name as Mom allowed him to to name me. (She gave my sister her name.). He chose to name me after his mom and my mom. But not all of our memories here have been happy ones. I said goodbye to my son's father in these walls...my dad was with my husband, in fact, when he took his last breath. I had called Dad to spell me for a time so I could take my little boy home, get him a clean set of clothes, and drop him off with my mom before heading back to the hospital for the night. For whatever reason, while I was gone, Jim slipped home to Heaven When the hospital tracked me down at my mom's house, I just didn't think I could face what awaited me at the hospital, but Dad stayed with me and helped me do the things I had to do. I remember how tightly he held my hand as he walked me to the elevator on the Cancer floor for the last time. I had a feeling that if he could have taken my grief and pain away from me, he would have. To spare him, I tried my best not to cry, but the burden of sorrow was nearly too much to carry. I remember feeling very weak and faint...almost like a balloon that could easily float through the ceiling of that tormenting place. I dare say that if I could have floated away from the pain that night, I would have...Dad right beside me. But what rooted us to the earth then and now, was love of my son...love of family...and a dim, though honestly weak, faith that God could somehow get me through this horrible moment in time. So now it's my turn to sit by him and scramble from my chair to his bedside when he struggles with the straps that hold his hands to his side, or when he wakes and becomes aware of the tubes in his throat. His eyes slowly open and he has even smiled at us through his medical miseries, and I try to stroke away the fear while whispering, "It's going to be OK...you're getting stronger every day...don't worry." He grasps my fingers when I hold his hand as I lean over his bed, and there is a little relaxing of his eyebrows as he watches me silently. We have the same gray/blue eyes...and we're familiar to each other. Hospital vigils are often not fun, and having the blessings of modern medicine can bring with it fears and relief, but being there for one another through all of them is the constant that ties these events together. Through it all, we go on and we keep holding hands, and stroking foreheads, and offering love and comfort...and living our lives, as much as possible, in and out of these familiar, yet impersonal, hospital walls. 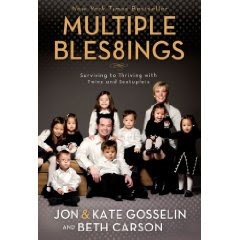 MULTIPLE BLES8INGS: SURVIVING TO THRIVING with TWINS and SEXTUPLETS is written by Jon and Kate Gosselin and Beth Carson. If you've ever watched the television series with this amazing family, you'll be familiar with the Gosselins. Their story, on TV, is remarkable, but reading the behind-the-scenes happenings and events that led to their eight children family (in only TWO pregnancies! )is equally remarkable. The one thing that surprised me most about this book is the spiritual depth in both Jon and Kate Gosseling. Each chapter of the book begins with a scripture, and their many decisions, leading to the birth of their twins and then the sextuplets, was bathed in prayer. Though Kate and Jon sometimes come across as angry or brittle with each other in the TV series, much more love and compassion is written in the book and it gives a deeper sense of who each of these remarkable young people are together and as parents. I read the entire book in one evening, as did my son, so it is not a heavy work of nonfiction: it is fun, happy, and spiritually satisfying. It has many photos scattered through the pages, as well as a small section documenting Kate's diary which she kept while on bed rest waiting for the birth of the sextuplets. I recommend this book to fans of the TV series and to other readers who will enjoy getting to know more about this loving and unique family. Their experience is well worth reading about and will warm your heart besides! When I found this verse recently, I thought, "I can't remember ever reading that before." Somehow, knowing God directs the snowfall, my heart understands that the gentle flakes have more meaning. Or maybe it's really that snow has more purpose. I've had to remind myself in winters past about the importance of snow, especially when it's March and a sunny day hasn't been seen in weeks. Instead, the snow covers every vestige of grass or growing thing by several inches. At those times, I have to audibly remind myself, "More snow means a better growing season." There are times, though, when I can't see beyond the cold and the white and the depressing feeling of being stuck inside. I can't see even two weeks into the future to know that a warm day or two will completely obliterate the seemingly invincible snow. That's when I have to get out the calendar and count the days until the rotation of the earth will bring us closer to the sun's warmth once again. When my life feels cold, dreary, or depressing, just like that calendar, I have to get out my Bible and remind myself of the ways in which the Son brings me closer to the warmth of my Father's Heart.